When your past students talk to potential students about your real estate school, what do they say? To put it simply, what they say defines your brand. That can be a little frightening to think about because, on some level, it’s out of your hands. But you probably have more control of your brand than you realize. Here are three ways you can influence the conversation about your school and develop a reputation as the kind of school people want to attend. Why do people choose to take real estate classes at your school? More importantly, when students have a great experience at your school, what are some of the primary influences on that experience? It could be exceptional instructors. Maybe it’s your knack for helping students understand difficult concepts, or the awesome study groups you organize for current prelicensing students. It might be a comfortable classroom, gourmet coffee, or exceptional technology that eliminates distractions and better facilitates learning. If you don’t know…ask! Survey every student who completes a class in your facility and analyze the results. Fight the urge to react to specific responses, but also watch for trends. You may discover some themes in students’ dislikes that are preventing you from providing a great experience. This is valuable information too. Knowing the gaps between what students value and what you provide can help you identify improvement opportunities, and make changes that will help you develop a better reputation. Selling real estate education is not a differentiator. All of your competitors do that too. The core of your school’s brand should be the intersection point between what students value and what you can do better than your competition. Once you’ve identified that, double down on it. Aim to make it a theme in every survey response you receive. In a fast-paced world, consistency can be hard to commit to. But it’s critical. Once you know what makes your school great, you need to make sure that message is woven throughout your marketing efforts. Business cards, ads, signs, sponsorships, social media—everything you do to build awareness for your real estate school should reinforce the brand. Consistency is the reason certain brands are associated with certain feelings. If you were hungry between meals, which candy bar would you purchase to hold you over? Perhaps a Snickers®? That’s because over time, through consistent delivery of a message, you’ve seen that brand associated with satisfying hunger. That same kind of association is what you’re trying to create with your school’s brand and your target market. You can’t fake your brand. If you sell on a promise of quality, and the reality doesn’t match the promise, students will see right through it. For branding to work, the student experience must meet or exceed the expectations you’ve set. To make sure your school is a living embodiment of your brand, it needs to become part of your culture. Make sure instructors and staff know what students value, and share your commitment to an exceptional student experience. 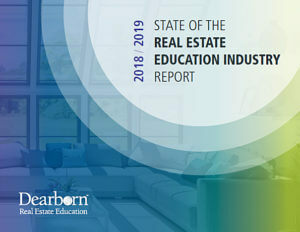 We talked to over 300 real estate educators across the country to get learn more about what and how you are teaching, where you see the industry going, how you’re spending your marketing budget, and what challenges you’re facing. We compiled the results in this free report.